Dyspepsia is not a diagnosis but rather a description of symptoms that may indicate disease of the upper gastrointestinal tract. However, in the majority of cases there is no clear pathological cause. 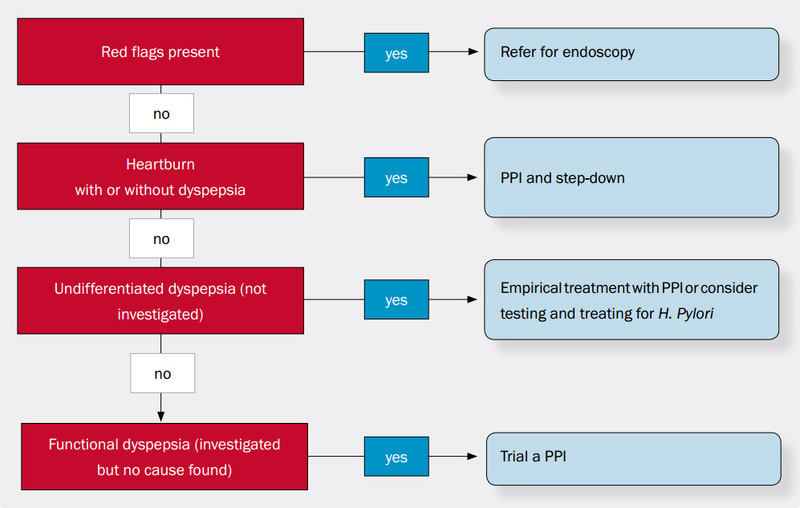 The initial assessment of a patient with dyspepsia involves ruling out any “alarm features” which may indicate more serious underlying pathology. In response to many requests, we have updated our 2007 article on managing heartburn, undifferentiated dyspepsia and functional dyspepsia in general practice (BPJ 4, April 2007). Dyspepsia is not a diagnosis but rather a description of symptoms that may indicate disease of the upper gastrointestinal tract. However, in the majority of cases there is no clear pathological cause and many people manage the symptoms themselves without consulting their GP. Undifferentiated dyspepsia is dyspepsia that has not been investigated. In a person at low risk of underlying pathology (See below), symptomatic management is appropriate, without the need for further investigation. Functional or non-ulcer dyspepsia is dyspepsia, which has been investigated and no underlying pathology found. Heartburn is described as a burning sensation rising from the epigastrium toward the neck. Heartburn, with or without associated dyspepsia, is most commonly associated with gastro-oesophageal reflux disease (GORD). Heartburn is often included within the description of “dyspepsia”. A number of features in the initial history or examination of people with dyspepsia or heartburn increases the likelihood of significant organic disease (see box below "Red flags for people presenting with dyspepsia”). The presence of red flags indicates the need for referral for further investigation with endoscopy. If there is evidence of gastrointestinal bleeding or severe dysphagia, referral should be immediate. Treatments for dyspepsia such as antacids, ranitidine and omeprazole are available for purchase over-the-counter (OTC) from pharmacies. Pharmacists should check for alarm features and advise patients to seek medical attention if indicated. Lifestyle advice is also important. GPs should check what OTC medicines a patient has used, as this may give an indication of the severity and duration of the dyspepsia. In the absence of red flags, the presence of heartburn is the single most important feature determining management. Heartburn, with or without dyspepsia, is usually related to lower oesophageal dysfunction and the presence of GORD. There is some evidence that obesity is a risk factor for the development of GORD.1 It is important that heartburn is differentiated from other causes of similar symptoms such as cardiac disease. Simple lifestyle modifications may resolve mild symptoms of GORD, but acid suppressing treatment, using a step-down approach, is required if symptoms persist. Barrett’s oesophagus is a complication of chronic GORD. It is a diagnosis made after endoscopy where normal cells lining the oesophagus (squamous epithelium*) are found to be replaced by cells that usually line the gastric and intestinal mucosa (columnar epithelium*). Patients diagnosed with Barrett’s oesophagus are usually treated with long-term, high dose PPIs. They require surveillance with periodic gastroscopy as they are at increased risk of developing adenocarcinoma of the oesophagus even with PPI treatment. *Corrected from print version, see BPJ35 for details. Offer simple lifestyle advice including; healthy eating, weight reduction, smoking cessation and limiting alcohol intake. Patients can be advised to avoid or minimise factors that seem to worsen their symptoms, such as bending over, eating shortly before going to bed and ingesting specific foods and beverages like alcohol, chocolate, spicy food and food with a high fat content. Some people may find that slightly raising the height of the head of the bed, while sleeping, may lessen symptoms. The most common cause of dyspepsia and heartburn in pregnancy is GORD.1 Dyspepsia does not usually cause complications in pregnancy and is likely to resolve after the woman has given birth. Assessment to exclude a more serious cause includes enquiring about alarm features and a past history of GORD or peptic ulcer disease. Lifestyle, eating habits and current use of over-the-counter medicines such as antacids should also be checked. Lifestyle advice is the usual first-line management, especially in the first trimester. If lifestyle advice does not adequately control symptoms, antacids or alginates can be tried if symptoms are relatively mild. Alginates, e.g. gaviscon, are particularly useful if heartburn symptoms are predominant. If symptoms are more severe, or persist despite treatment with an antacid or alginate, consider prescribing an acid-suppressing medicine such as ranitidine or omeprazole. Both of these medicines are considered to be relatively safe in pregnancy but omeprazole is more effective and a recent study has shown no association with major birth defects when administered in early (first trimester) pregnancy.8 As with any medicine used in pregnancy, especially in the first trimester, treatment should be with the minimum effective dose for the shortest possible time. Best Practice Tip: It is generally recommended that PPIs (particularly omeprazole) are taken in the morning, 30 minutes before food, for optimal acid suppression. There is a theoretical basis for this but for many people, the timing in association with food is not important. However, when assessing response to a PPI or before considering a dose increase, it is worthwhile checking to see if the medicine is being taken as recommended. Dyspepsia can occur at any age but in older people it is more likely to be associated with organic diseases such as peptic ulcer disease or gastric cancer. NSAIDs, including aspirin, are a major cause of dyspepsia and peptic ulcers and these medicines are more frequently prescribed in people over 65, who in turn are more susceptible to complications. There are no accurate figures linking the prevalence of dyspepsia with ethnicity in New Zealand. However, H. pylori infection which is associated with peptic ulceration is more common among Māori and Pacific peoples. In dyspepsia without heartburn that has not been investigated (undifferentiated dyspepsia), first rule out the possibility of serious disease, based on the presence of red flags. Review lifestyle factors and use of medicines that may be exacerbating symptoms. Patients can then be managed by either empiric treatment (usually with a PPI) or testing for H. pylori. If there is no response to a PPI or H. pylori treatment, trial an H2-antagonist or a prokinetic (e.g. domperidone, metoclopramide) for one month. Referral can be considered at this point. However, H. pylori infection rates are generally declining and a one month trial of a PPI is a reasonable approach for most patients with undifferentiated dyspepsia. In the past, testing and treating for H. pylori was encouraged because H. pylori infection is a known risk factor for gastric cancer. As the prevalence of H. pylori infection is falling, the gastric cancers associated with H. pylori are also becoming less common. Screening of asymptomatic patients is not recommended unless there is a family history of cancer or ulcer disease. If testing for H. pylori is indicated, the best test to use is dependent on the clinical setting. There are three tests, apart from performing endoscopy, to check for H. pylori infection. The most accurate test, in all clinical scenarios, is the Carbon-13 urea breath test. This test will determine if the patient has an active infection. However, this test is expensive and is not generally available. The faecal antigen test can also determine if active infection is present, but false-negative results are possible, which will limit interpretation when a diagnosis is required. Serology, using a blood sample, will show exposure to the infection, but this does not always mean that active infection is still present. From a general practice perspective, serology is easy to obtain and is a reasonable approach for testing for H. pylori. A faecal antigen test is recommended to detect loss of infection after treatment. For H. pylori eradication a seven day course of omeprazole 20 mg, clarithromycin 500 mg and amoxicillin 1 g (or metronidazole 400 mg, if allergic to penicillin), all taken twice daily is recommended. Note that the combination pack (Losec HP7 OAC) is no longer subsidised but triple therapy is subsidised if all three medicines are co-prescribed. Many people have now been taking a PPI for several years and there have been a number of studies investigating long-term safety. Most studies are observational which cannot establish causality. There is no proven link with an increased risk of gastric cancer or nutritional deficiencies. From a general safety standpoint, PPIs should be used at the lowest effective dose for the shortest possible time and regularly reviewed. The data is conflicting as to whether PPI use is associated with an increased risk of bone fracture. There is a possible increased risk of fractures of the hip, wrist and spine. Long-term use of PPIs does not lead to vitamin B12 deficiency except possibly in elderly people, or in people with Zollinger-Ellison Syndrome who are on high doses of a PPI for prolonged periods of time.9 Routine testing for vitamin B12 is not advocated but may be advisable for such patients at increased risk. Interstitial nephritis is characterised by acute renal failure, arthralgia, malaise and fever. Omeprazole can be used to reduce the risk of gastrointestinal complications from antithrombotic treatment. However, omeprazole has been shown to decrease the formation of the active metabolite of clopidogrel and potentially reduce its anti-platelet effect. There is ongoing debate as to whether concomitant use of omeprazole and clopidogrel translates to adverse cardiovascular outcomes. Current advice from Medsafe is to avoid concomitant use. This advice may change as more evidence becomes available. Defined pathology is unable to be identified in approximately half of the patients referred for endoscopy, and this is classified as functional dyspepsia. The cause of functional dyspepsia is not clearly understood and is likely to be multi-factorial. Some cases appear to be related to hyperacidity with associated heartburn and reflux symptoms, whereas others appear to be related to a disorder of gastrointestinal motility. Psychosocial and psychological factors may be involved but it is not known how significant these factors are on a population basis. A PPI is considered first line treatment for functional dyspepsia, with or without symptoms of hyperacidity. Management follows the same approach as for undifferentiated dyspepsia. Thank you to Dr John Wyeth, Gastroenterologist and Clinical Director of Medicine, Capital & Coast DHB, Wellington for expert guidance in developing this article. CKS (Clinical Knowledge Summaries). Dyspepsia. National Institute for Health and Clinical Excellence (UK). Available from: www.cks.nhs.uk (Accessed Jan, 2011). Vakil N. Dyspepsia, peptic ulcer and H pylori: A remembrance of things past. Am J Gastroenterol 2010;105:572-4. Ford AC, Moayyedi P, Jarbol DE, et al. Meta-analysis: Helicobacter pylori 'test and treat' compared with empirical acid suppression for managing dyspepsia. Aliment Pharmacol Ther 2008;28(5):534-44. Hojo M, Miwa H, Yokoyama T, et al. Treatment of functional dyspepsia with antianxiety or antidepressive agents: systematic review. J Gastroenterol 2005;40(11):1036-42. Brun R, Kuo B. Functional dyspepsia. Therap Adv Gastroenterol 2010; (3):145-64. Pasternak B, Hviid A. Use of proton-pump inhibitors in early pregnancy and the risk of birth defects. N Engl J Med. 2010;363(22):2114-23. Thomson ABR, Sauve MD, Kassam N, Kamitakahara H. Safety of the long-term use of proton pump inhibitors. World J Gastroenterol 2010; 16(19): 2323-30. Gray SL, LaCroix AZ, Larson J, et al. Proton pump inhibitor use, hip fracture, and change in bone mineral density in postmenopausal women: Results from the Women’s Health Initiative. Arch Intern Med 2010;170(9):765-71.